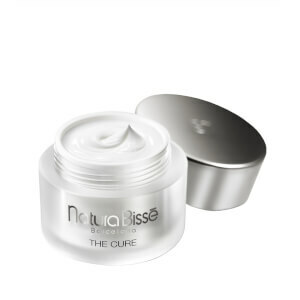 Quench dry skin with the Natura Bissé Oxygen Mousse, a refreshing foam cleanser that effectively works to eradicate dirt and grime whilst minimising the look of pores. Ultra-lightweight, the silk-textured face wash effortlessly sweeps away impurities and unclogs pores to leave skin looking refreshed and radiant. Formulated with Living Water, it’s enriched with the benefits of Spirulina Algae, brimming with vitamins, minerals and proteins to intensively nourish and purify, whilst extract of Mushroom seeks to deliver long-lasting hydration. Expect revitalised and radiant skin with a velvety smooth matte finish. Use daily, morning and night. Apply to your slightly damp face, neck and décolleté using a gentle, circular massage. Rinse off, using generous amounts of water, and pat dry. Water (Aqua), Glycerin, Sodium Lauroyl Sarcosinate, PEG-6 Caprylic/Capric Glycerides, Sodium Cocoyl Isethionate, Cocamidopropyl Betaine, Fomes Officinalis (Mushroom) Extract, Plankton Extract, Betaine, Arginine, Butylene Glycol, Benzotriazolyl Dodecyl p-Cresol, Tetrasodium EDTA, Disodium EDTA, Citric Acid, Sodium Chloride, PEG-40 Hydrogenated Castor Oil, Phenoxyethanol, Methylparaben, Fragrance (Parfum), Butylphenyl Methylpropional, Hexyl Cinnamal, alpha-Isomethyl Ionone, Linalool, Citronellol, Limonene.